12 years .. what can we say .. it has been and still is a wonderful ride ! Through different venues, many evolutions and with a whole array of artists and records, we have been constantly bringing you - what we feel - are the better sounds of techno music. And we hope to be doing it for may years still to come! Joey Beltram produced the anthem “Energy Flash”, by many considered as the record of the decade ten years after it’s release in 2000. After producing for labels as R&S, Warp and Novamute, he launched his own label STX in 1999 that is on it’s 13th release, a Joey Beltram track called Orch7 released last May. In the meantime he also found the time to bring out the album ‘The Rising Sun’ on Tresor records. As you know by now, we never limit ourselves to big guns only but always save some room for not-to-be-missed new talent and Quince definitely falls into that category. After the amazing album En.vi.sion on the highly acclaimed Delsin imprint, also Music man is now proud to present it’s first Quince release : The Summit will be in stores as of September 24th. 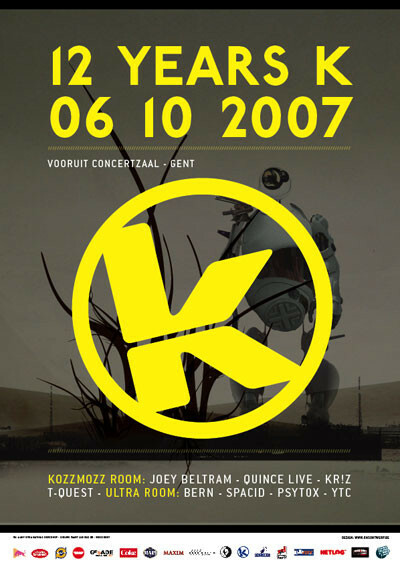 Our compatriot T-Quest has been playing for Kozzmozz since the very beginning. He knows how to make the Kozzmozz-crowd go wild like no other! Kr!z is one of those few dj’s who possesses the gift to play great records and have an astonishing mixing technique. And there’s more: Kr!z recently presented his own label Token records, on which he released records by Inigo Kennedy and Sub Space (aka Julien and Gonzague)! And as it’s our birthday, we couldn’t limit ourselves to just one room, so we have invited our latest concept Ultra to join us in the celebrations. And as a guest we have the Frenchman Bern who in a brief period of time, managed to get releases out on lots of leading minimal labels as Traum, Trapez, Toys for Boys, … and is also very active in the net-label department. He will be joined by Psytox who has gone vinyl with his internet label Coincidence records with a first release by Tom Dazing and a new one by Deep’A & Vek (Israël) to be released after the summer. Our Ultra resident Spacid who has played all big festivals in Belgium and has lots of foreign gigs, will also be present and as we helped to start the Young Talent Corner concept, we couldn’t have a birthday without one of the young talents behind the decks: send in your demo’s through: www.poppunt.be today!